"The Saudi TV channel Al Arabiya has come under fire for publishing a fake photo online. On Monday, it posted the following photo to its official Twitter account. The description, in Arabic, reads: “Al Arabiya exclusive: Saudi Arabia’s Operation Decisive Storm destroys a Houthi military convoy in Saada [Yemen].” There’s just one problem: that photo is an iconic photo from the first Gulf War. According to information provided by the US Department of Defense, which put the image in the public domain, it was taken by a military photographer on March 4, 1991 during Operation Desert Storm. The photo shows Iraqi military vehicles that were destroyed by coalition forces." "A conference at the University of Southampton discussing the right of Israel to exist has been cancelled, say the organisers, who have accused the institution of bowing to pressure at the expense of free speech. The conference, due to take place next month, described itself as “unique because it concerns the legitimacy in international law of the Jewish state of Israel”, but critics denounced it as one-sided. Among those who condemned the conference were the Jewish Board of Deputies, and MPs including Eric Pickles, the communities secretary, and Caroline Noakes, MP for Romsey and Southampton. The Zionist Federation UK arranged a petition opposing its staging that attracted more than 6,400 signatures. A counter-petition signed by more than 800 academics, including from Oxbridge, Russell Group and US Ivy League universities, urged Southampton to resist the pressure." So basically, according to her, if only the good terrorists of Nusrah can get rid of the foreigners among them so that they can establish their secular and moderate Islamic state. If only. There is clearly a conflict between UAE and Saudi Arabia over some matter. 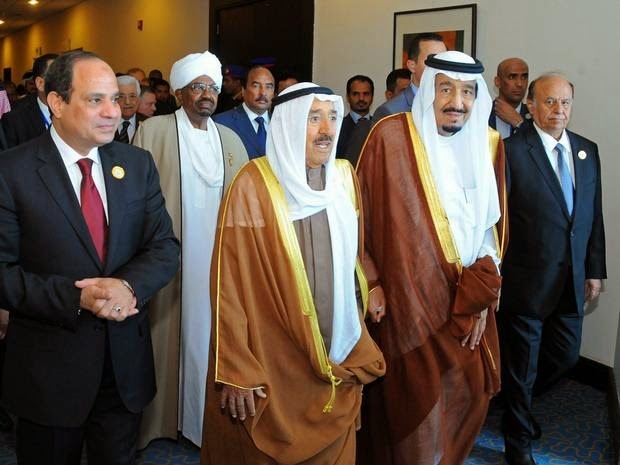 The level of representation of UAE in the Arab summit was one of the lowest in recent memory. It is possible that the Saudi regime is now reconsidering the policy of launching war on the Muslim Brothers realizing that they can be used in this sectarian regional war. They all inaccurately reported that the Arab League summit agreed on the formation of a joint Arab military force. No such agreement. What they agreed upon is the formation of a committee to look into the formation of a joint Arab military rapid intervention force. Big difference. "The first myth is that this war represents yet a new front on a massive regional Sunni-Shiite struggle. The reality is that a great deal of this struggle is heavily among Yemeni Shiites themselves. Yes, the Houthis, who are now well on the way to seizing leadership of the entire country, are indeed Shiite. They are Zaydi Shiites to be specific (also known as Fivers, believing in five imams) -- who differ significantly from Iranian Shiites (mostly Twelvers). Indeed, among the various schools of Shiism, Zaydism is theologically closest to Sunni Islam. Sunni and Shia have co-existed quite well in Yemen over long centuries. But the Zaydi Shia remain a major force in the country (some 40 percent) and are dominant in the north. Furthermore, the two most important tribal confederations in the country are also both Zaydi. So was the former president of Yemen for 32 years, Ali Abdullah Saleh (overthrown in the Arab Spring and who now may be secretly supporting the Houthis). The Houthis are simply one regional Zaydi clan who happen to be rebelling for an end to what they saw as discrimination and the corruption of Saleh and his successor -- both Saudi-supported Shiites. Typically the Houthi movement takes the form of a revivalist movement seeking cleaner government and a "purer Zaydism."" "Hezbollah probably has advanced missiles". "Ironies abound. Terrified by the popular Arab schadenfreude expressed in massive demonstrations across the Arab world in solidarity with Iraq, demonstrations that did not sympathize with Kuwait and other oil-producing Gulf countries, the illiberal Saudis launched pan-Arab newspapers and satellite channels that bombarded the Arab world with pro-Saudi and pro-US liberal propaganda to reverse this Arab anti-imperial nationalist tide that also opposed the Arab regimes allied with US imperialism. Intellectuals from across the Arab world joined the effort, abandoning old leftist, communist, Nasserist and Islamist positions and adopted the much, much more profitable pro-US and pro-Israel liberal line politically, and the neoliberal economic order being globalized. By the dawn of the new century, the Saudis and the Americans issued new orders to their media and agents to spread an unprecedented sectarian campaign against Shiites inside and outside the Arab world. The campaign would be first articulated in 2004 by the new and neoliberal King Abdullah of Jordan, a self-styled “liberal” monarch who possesses absolute and unchecked power. The king expressed his and others’ fear of the rise of a “Shiite crescent” in the region.."
There are two groups of experts being cited in mainstream US media: 1) the usual suspects of WINEP who are never identified as they should as being part of a research arm of the Israeli lobby; 2) experts with ties to the Saudi regime. One expert in fact works for the Saudi Ministry of Interior and yet is identified as "Middle East expert". For years, Sa`d Id-Din Ibrahim has been claiming in the Arabic and Western press that he coined the term "jumlukiyyah" (a word that combines republican and monarchist in reference to republican dynastic rule as in Syria or Libya or Iraq). Not true. Saudi dissident, Nasir As-Sa`id (who was kidnapped by Arafat's goons and surrendered to Saudi intelligence in Lebanon who killed him) used it long before Ibrahim in his book Tarikh Al-Saud (p. 853). 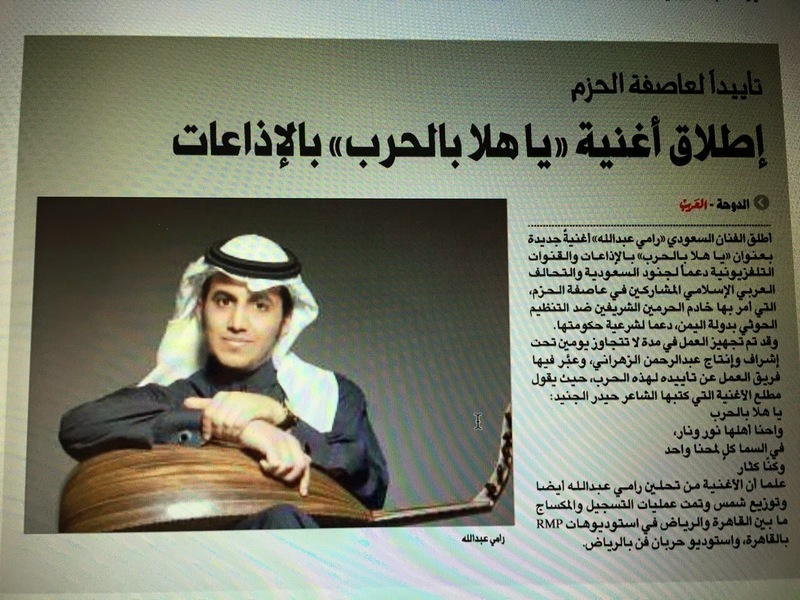 This Saudi paper reports about a new hit in Saudi Arabia: a song called "Oh, Welcome War". Enjoy. This front page of Al-Jazirah paper from the days of the Shah in the 1970s features an interview with then Crown Prince Fahd. In the interview he said: "Kingdom declares support for the regime of Shah of Iran." Pakistani Army has been hired for internal repression in Arab countries before. Don't forget that the tyrant Zia Ul-Haq served in Jordan during Black September alongside Jordanian regime troops in the massacres of Palestinians. "Insurgents could take revenge on pro-government residents". Pro-government residents? And how do they determine that? Do they have markings on their foreheads? It is over after two days only: "“I think they’re losing this battle,” Khatib said of the Houthis". Mark your calender. "She offers few bold or risky ideas. On foreign policy, for example, she says little beyond noting that Israel is a close ally." From a well-known US correspondent who does not wish to be identified: ""These vessels belonged to Egyptians who lived in the land of Israel in 3100 BC." The land of Israel? In 3100 BC? Abraham wasn't born until 1800 BC. There was no Israel in 3100 BC." "Mr. Menendez received enthusiastic applause addressing Aipac, the prominent Israel advocacy group, this month; it has contributed to his legal defense fund and has privately pressed other Israel-oriented donors to do the same. By the end of 2014, Mr. Menendez had raised more than $200,000 for his legal fund — nearly a quarter of all its receipts — from political donors who have also given to pro-Israel political action committees, according to an examination of financial documents filed by the Robert Menendez Legal Expense Trust." Tell Anne Barnad and Liz Sly: what moderate Syrian rebels? Nusrah terrorists ban Syrian National coalition from Idlib. technology in order to strengthen the regime ’s grip on political life." "Ahmad Kara Ali, a spokesman for Ahrar Al-Sham, said in an interview that his group would not allow any other group to “monopolize power” in Idlib. “We are counting on the awareness of the Syrians and the rebels not to let any of the parties to repeat the experience of Daesh,” he said." In fact, Ahrar Ash-Sham, as this writer of As-Safir explains, is still under the direct sponsorship of none other than Ayman Adh-Dhawahiri. And one of its leader, Abu Hafs, is an old friend of Dhawahiri, and some mentions him as one of the founders of Al-Qa`idah in 1998. PS What is hilarious is that Barnard refers to Ahrar Ash-Sham as "ultra-conservative" as if we are talking about a political party seeking representation in the Swedish parliament. Liz Sly and the Washington Post now refer to Al-Qa`idah as "Syrian rebels"
You can see her cheering the the Bin Ladenites: "The rebel force, led by the al-Qaeda affiliate Jabhat al-Nusra". "The Al Nusrah Front, al Qaeda’s official branch in Syria, has released another video showing its fighters using American-made TOW missiles. As The Long War Journal reported earlier this week, Al Nusrah released a video featuring a TOW missile attack in the early hours of the jihadists’ newly-launched offensive against Syrian regime forces in the city of Idlib." "Turkish officials have expressed their satisfaction at the seizure of the northern Syrian city of Idlib by opposition forces, stressing that the Ankara-supported Free Syrian Army (FSA) was part of the winning side. The coalition that seized Idlib city on March 28 was composed of the al-Nusra Front, the official Syrian affiliate of al-Qaeda, as well as several Islamist factions." "The backing of the West gives Saudi’s position legitimacy." Yes, there is nothing that accords legitimacy to an Arab party or regime than Western support. IT does it. Also, can we do away with importing Western media cliches about "the region's policeman" especially when the regime in question is in fact supporting the criminals and terrorists of the region? That is no policeperson by my book. "Saudi Arabia withdrew its ambassador and stopped issuing visas to Swedish businessmen. The United Arab Emirates joined it. The Organisation of Islamic Co-operation, which represents 56 Muslim-majority states, accused Sweden of failing to respect the world’s ‘rich and varied ethical standards’ — standards so rich and varied, apparently, they include the flogging of bloggers and encouragement of paedophiles. Meanwhile, the Gulf Co-operation Council condemned her ‘unaccept-able interference in the internal affairs of the Kingdom of Saudi Arabia"
From Nu`man: "On Yemeni demographics: Its said that Zaydis (otherwise referred to as Shi'ah in the media) are 30-40% of Yemen. Obviously this was not always the case. I remember reading many, many years ago that Zaydis were about 60% of Yemen (or of the old North Yemen). The rest was made of up (shafa'i) Sunni muslims. The split is along geographical lines. Anyone south of Ta'iz and stretching to the east into Hadramout was assumed to be Sunni while everyone to the North of Ta'iz was assumed to be Zaydi. Now one of the reasons the that Zaydi numbers have decreased is because from the mid-1970's North Yemen (before unification in 1990) ran two parallel education systems: Firstly there was the State education system; Secondly, there was the Islamist education system (run by people who later were to form the Yemen's Muslim Brotherhood, Islah Party). The Islah schools were known as Ma'had al-Elmi (Scientific Institute). These 'Scientific Institutes' were originally funded by Saudi Arabia and had a two fold target. In the 70's & 80's, secular left politics was still strong in the Yemen so by Islamically brainwashing children in Yemen, the Saudis (British?) thought less and less people would join left-wing movements when they become adults. 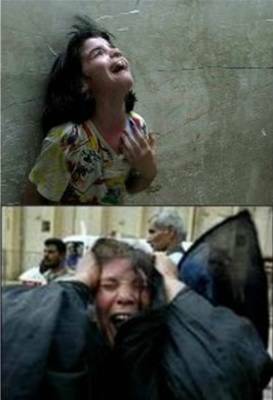 The other purpose of the Scientific Institutes was clearly to turn Zaydi children into Sunnis. By the time the Scientific Institutes were disbanded in the mid-1990's there were well over 1,100 of them operating in Yemen. "The Saudi ambassador in Washington, Adel al-Jubeir, said Friday that the U.S. has been "very supportive" of the operation politically and logistically. He said the kingdom is "very pleased" with the level of coordination with the U.S., which has established a joint planning cell with Saudi Arabia to coordinate U.S. and military and intelligence support." "Rice", which also denotes fortune or wealth. Basically, the richest Arab countries, supported by the richest countries of the world, are launching a war on the poorest Arab country--oh, and in the name of democracy for sure. Yemeni people have bitter feelings about House of Saud: not only for their role in supporting the reactionary monarchy and in their role in prolonging the civil war, but also for expelling hundreds of thousands of Yemeni workers from Saudi Arabia in 1990 because Salih stood against the US-Saudi-Syrian war on Iraq. "How do you calculate the human costs of the U.S.-led War on Terror?" "with at least 1.3 million lives lost in Iraq, Afghanistan, and Pakistan alone since the onset of the war following September 11, 2001." "A politically useful option for U.S. political elites has been to attribute the on-going violence to internecine conflicts of various types, including historical religious animosities, as if the resurgence and brutality of such conflicts is unrelated to the destabilization cause by decades of outside military intervention," they write. "As such, under-reporting of the human toll attributed to ongoing Western interventions, whether deliberate of through self-censorship, has been key to removing the 'fingerprints' of responsibility." "
" “The meeting concluded that any threat to Saudi Arabia’s territorial integrity would evoke a strong response from Pakistan.” (Nevermind that in this instance, it appears Saudi Arabia is leading an intervention into the territory of another state.)" "The former Pakistani President Zia-ul-Haq once even commanded a unit of troops in Jordan tasked with combating Palestinian fighters." "Britain will support the Saudi-led assault on Yemeni rebels “in every practical way short of engaging in combat”, the Philip Hammond, the Foreign Secretary, said on Friday. In a briefing while on a visit to Washington, Mr Hammond confirmed that British-built aircraft were being used in the campaign, in which Saudi Arabia and its Sunni Arab allies have bombed targets throughout the country." "“I moved my party to the center and I will continue forcefully to stage my party to the center. The only way to win in Israel is by being in the center.”"
"Exposing Anti-Islam Author Ayaan Hirsi Ali’s Latest Deception"
Are you aware that Gen. Sisi described the internet the other day as "the new terrorist danger"? Obama: "for the first time in nine years, there are no Americans fighting in Iraq... ...four years ago I promised to end the war in Iraq, we did"
"The Arab-led, American-supported coalition seeking to rout Houthi rebels in Yemen includes a man indicted on charges of war crimes and vilified by Washington for more than a decade: President Omar Hassan al-Bashir of Sudan." ‏‏‫#عاصفة_الحزم‬‏ He manages to spew hate against Jews and Shi`ites in one sentence. PS He is now considered "pro-Western" and "moderate" by US media standards. Hell, I won't be surprised if he is invited to address US Congress for his anti-Iranian efforts. Unfortunately for House of Saud, this Yemeni war--unlike the 1960s--is not managed by Field Marshal `Abdul-Hakim `Amir. "The official said Houthi forces were being trained and supported on the ground by about 5,000 experts from Iran and its regional allies, the Hezbollah group in Lebanon and Iraqi Shi'ite militias." This article basically opens space for GCC propaganda to be vomited to readers of Western papers. No rebuttal and no refutation or correction allowed. "An Israeli cluster bomb has injured six boys in Lebanon’s southern village of Zibqine, according to Lebanon’s state-run National News Agency. Local media reports say the children were taken to the Lebanese-Italian Hospital in Tyre after approaching a cluster bomb left behind from the the 2006 war. The children were reportedly finishing their picnic in a valley between the villages of Zibqine and Ezziyeh, when the bomb detonated. Security sources say the victims were between six and eight years old. “We were having a picnic next to a river in Zebqin and on the way back, my friend stepped on a device that exploded, and we were all hit,” six-year-old Hussein Bazzi said, according to Agence France-Presse. According to the United Nations mine center, more than 30 Lebanese civilians have died in cluster bomb blasts in Lebanon since the war ended. The UN adds that Israel dropped 4 million cluster bombs during the 34-day conflict." We discovered yesterday a secret of his affinity with House of Saud. Like them he is an illiterate who can't read. The Youths of the "Arab Spring"
What the paper does not say is that he was the biggest cheerleader for Bush and his war among the press corps in Iraq. "Hezbollah’s leader, Hassan Nasrallah, denounced the Saudi-led operation Friday, accusing the kingdom of unleashing Sunni extremists like Al Qaeda against Shiites elsewhere." This is a total fabrication, of course. He never speaks in such sectarian terms. He only made one sectarian reference in the speech when he said that Iran supports Hamas and other Palestinian groups who are Sunnis, and he prefaced his remarks by apologizing to the audience for using the sectarian language that he consistently avoids. Barnard, who had studied Russian in college, and who knows not one word of Arabic, relies on supporters of Hariri movement and of Free Syrian Army to report to her about the Arabic speeches. They made that part of the speech up. He never said that they send Sunnis against Shi`ites. In every reference that Nasrallah makes about Takfiri group he goes out of his way to say that they pose a greatest dangers to Sunni Muslims. He did accuse the Kingdom of sending terrorists to Iraq but he didn't speak in the sectarian language that was fabricated in this piece. You see all those Western journalists don't speak Arabic and can't follow a speech in Arabic. They have a clear political agenda on Syria and Lebanon (in alliance with the allies and clients of Saudi Arabia) and their staff (translators, chefs, cooks, servants, fixers, free lancers are all part of March 14 of Syria and Lebanon because that is where the jobs are) have a political agenda and they rely on the Hariri media to cover what is happening in Lebanon and Syria. Look at this blatant distortion of Nasrallah speech on Yemen: "In a lengthy speech Friday night, the Hezbollah leader Hasan Nasrallah poured scorn on Saudi Arabia’s attempt to influence the outcome of the Yemeni conflict, saying that it is doomed to fail “because these are the laws of God.”" This was part of a humorous section of the speech when he mocked the Saudi regime and said that they follow the religion of Bush. This is a total fabrication. This sentence was taken out of context. In fact, he said that they will fail because conquerors and occupiers will fail. They don't care if they lie and fabricate because no readers will dare to write and tell them that they lied in their coverage of Nasrallah speech. If the distortion affected an Israeli or Zionist leaders, there would be demonstration in front of the buildings of those papers. Journalism, my potato. Translation: "There was a mistake on my part with my accusation that Nusrah Front was far from our goals. It is a major part working to fulfill the aspirations of the rebel Syrian people". Do you want to bet that none of the Western journalists who wrote laudatory profiles of this Idriss guy will cover this recent statement? And notice that those Hizbullah "commanders" who don't confide in ARAB media that are sympathetic to them decide to exclusively confide to Western media that are hostile to them and really say the most damning and damaging things about themselves. Is this like the guy who paid some locals in the Southern Suburbs to play paintball or pinball with him and then wrote an article about how he played paintball with Nasrallah or something like that? Here the Economist correspondent (a cheerleader for Free Syrian Army, of course): "That may be fanciful. Hizbullah fighters are contemptuous of their Shia comrades elsewhere. “Hizbullah follows the Koran; our men have a role, tactics and a plan,” says the brigade commander. He calls some Iraqi militias “extremists” and criticises their brutality. Western journalists and other supporters of the Syrian "revolution" have been celebrating in the last two days what they call "the liberation of Idlib". It is left unmentioned that the city was "liberated" by the followers of Bin Laden (allies of US and its allies in the region these days--if only the US public knows). 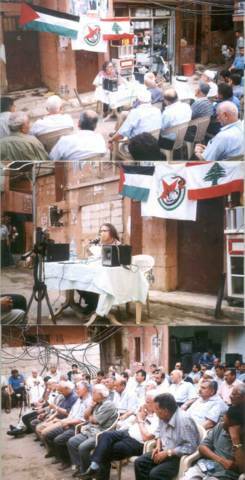 Do you know that Anne Barnard, jubilant about the victory by the followers of Bin Laden, decided to call the terrorists of Nusrah yesterday "insurgents"? She promises that she will call them freedom fighters if they liberate more towns. But look how Barnard made seem that Nusrah terrorists were merely one element of the fighters when they were the dominant force by all accounts: "A coalition of Islamist insurgents, including a branch of Al Qaeda". Do you know that the Saudi regime supported the "Shi`ite" side (i.e. Zaydis according to the silly terminology of present-day Western media) in the 1960s, while Nasser supported the Republican side? The conflation (on theological and terminological grounds) of Zaydis and Shi`ite twelvers is silly and ignorant when there are deep differences between them (as there are between `Alawites and Shi`ite twelvers (do you know that in the 1980s and early 1990s, during the conflict between Hizbullah and the Syrian regime there were articles in Western media which tried to explain the conflict in references to sectarian differences between `Alawites and Shi`ites)? Zaydis disagree, for example, with the hostility of Shi`ite twelvers toward the first three rightly-guided caliphs. Sectarianism is only relevant in that the Saudi regime and its allies have been invoking sectarian hatred in the last decade in order to undermine the stance of Iran and its allies in the region. Do you notice this trend? Whenever a pro-Western dictator is forced to leave office, Western media SUDDENLY discovers his corruption and suddenly unearths "evidence" that he has amassed billions upon billions of dollars. Which raises the questions: how come you didn't write about the corruption of Mubarak, Bin Ali, and Salih when they were in the pockets of the US? And in all cases the figures that are bandied about are highly inflated. Finally, did you notice that there are no Western reports about amassed fortunes by Bashshar Al-Asad? I noticed that. I wonder why. 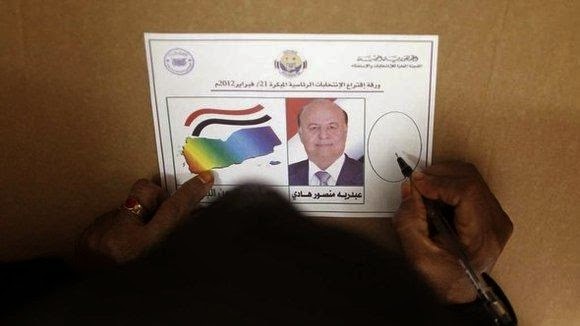 This is the ballot that was designed by Saudi Arabia and the US to install this former deputy to `Ali `Abdullah Salih as president of Yemen. There was not even a choice. (Of course, Hadi resigned and his term expired according to the very agreement by US and Saudi Arabia). 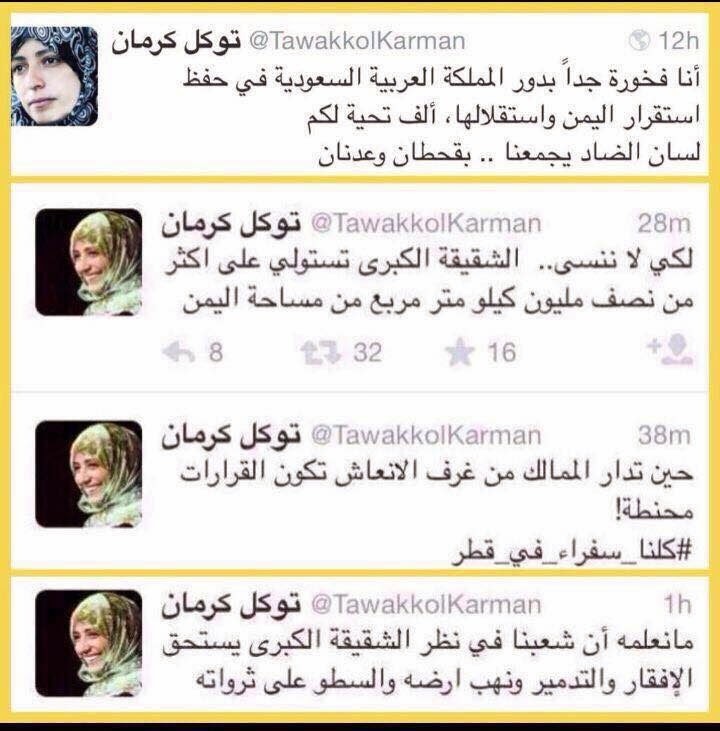 Tawakkul Karman wrote bitter against the Saudi regime and in praise of the Qatari regime. In the last few weeks, she has been tweeting fawning praises for the Saudi regime. Now we know why the US Department of State and the Nobel Committee rewarded here. The armed Arab is heading towards Yemen while the boy is saying: Palestine, this way. I am still repeating to myself the immortal words of Nasser from his 1962 speech (see link from yesterday): "The boot of every one them (his soldiers in Yemen) is more noble than the crown of King Saud and King Husayn". Is it not noteworthy that not a single member of the House of Saud dares to address the Saudi people or the Arab people? They left it to their ambassador in Washington, DC to address the...American people. The Hariri kangaroo court in the Hague is really not worth commenting on but the lies have accumulated in the last week. 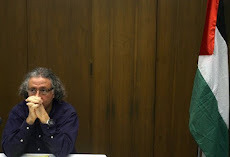 Sanyurah was testifying as a "witness" (to what, I am not sure) and he went on to describe his acquaintance with Rafiq Hariri and that the two met while being active in the Movement of Arab Nationalists. He defined the movement to the court thus: "A pacifist party that believed in Lebanonism and Arabism". I kid you not. So George Habash and Wadi` Haddad were leading a pacifist party? The movement called for the dissolution of all Arab countries in one all-encompassing entity and yet he said that it believed in Lebanon. Of course, the lousy defense team there didn't even contradict him or expose his lies. My weekly article in Al-Akhbar: "The pain and suffering of Fu'ad Sanyurah during the years of the Syrian epoch". "Israel killed more Palestinians in 2014 than in any other year since 1967"
"Israel killed more Palestinian civilians in 2014 than any in other year since the occupation of the West Bank and Gaza Strip began in 1967, a UN report has said. PS I think the report is wrong. Israel killed more in 1982. Rami Udwan (the son of Fath leader, Kamal `Udwan, who was killed by Israeli terrorists in 1973) wrote on his Facebook page today the following: "The Friday sermon [in a mosque in `Abdun, west of Amman, as he told me] today explained how the Shi`ites are our enemies and that they are more a priority to fight than the Jews, and that they are people of conspiracies, and false doctrines, and that they have been allies of the Jews all their lives, and that they hate companions of the prophet". US media and government talk about hate in mosques and not realize (or not care to admit) that the mosques are run and controlled by the pro-US clients themselves. الحمدلله اللي يسرلنا امام جمعة عميق ومطلع ومصلح وعرفنا انو في ناس مش أنقياء واطهار مثل اهل السنة ..."
Syrian pro-Saudi opposition figure (and "intellectual) Muhy Ad-Din Ladqani (who used to write for Ash-Sharq Al-Awsat (mouthpiece of Prince Salman) that he was able to obtain proof that Obama is Shi`ite and that this explains his pacifism toward Saudi Arabia's enemies in the region. He said that he verified the information in Kenya. So a group of Lebanese leftists activists wanted to organize a protest in front of the Saudi embassy in Lebanon. They went around asking parties if they are interested in joining. Hizbullah, typically, refused and said that it won't participate. Don't be surprised if Hasan Nasrallah today in his speech says that he wants "the best relations" with the Saudi government. "After forcing the children – at least one as young as four – out of their beds, the video shows the soldiers in full combat gear, armed with rifles and hand grenades, photographing and interrogating them." "In a sign of the broadening scope of Barack Obama’s intervention across the region, officials in Washington said the US was establishing a “joint planning cell” with Saudi Arabia to co-ordinate the air strikes on the Houthi forces seeking to overthrow the Yemeni government." "A widening Yemen conflict could pose risks for global oil supplies,"
"Israel conducted one “secret” (unacknowledged) nuclear test in 1979 in a remote area of the Indian Ocean in conjunction with the apartheid regime of South Africa, which helped both countries develop the bomb." So basically the US governments supports the GCC operation which aims at reestabishing bases of support for Al-Qa`idah and its affiliates and to defeat the foes of Al-Qa`idah in Yemen. "Imagine that someone has wronged you, and you sue them. Then the government magically appears in court and asks that your suit be dismissed because, for reasons it won't tell you, state secrets might be dredged up in the course of the litigation. You have no idea what they're talking about. But after secret discussions with the judge from which both you and the defendant are excluded, the court dismisses your suit. This Kafkaesque scenario couldn’t happen in the U.S., right? Not until Monday, it couldn’t. But a federal judge in the Southern District of New York just did exactly this, dismissing a defamation suit by Greek shipping magnate Victor Restis against a shady advocacy group called United Against Nuclear Iran. This is the first time a U.S. court has dismissed a lawsuit on the basis of state secrets when the case didn't involve either the government or a defense contractor deeply enmeshed with classified government contracts. It's also a marvelous example of how secrecy fundamentally distorts the legal process and subverts the rule of law. Usually when I write about a case, I begin by describing the facts. Here the facts are so secret I can barely say anything. United Against was founded in 2008 by a former CIA director and a group of retired diplomats to advocate against the nuclear Iran. Its board includes former directors of foreign intelligence services including the U.K.'s MI-6, Germany's BND -- and Israel's Mossad. The Department of Justice intervened in September, asserting the state secrets privilege. That so-called privilege doesn't come from the Constitution or from statute. It’s an unwritten judicial rule that allows the government to block discovery of information through ordinary litigation “when disclosure would be inimical to national security,” as the district court described it." "USA supports democratically elected govt in Yemen, therefore supports Saudi bombing." From Nu`man: "So the White House says that it “strongly condemns ongoing military actions taken by the Houthis against the elected government of Yemen,” so therefore it supports the bombing of Yemen by the democrats of Saudi Arabia and the other despots. Who do they think they are fooling? :"
It declared its support for the GCC invasion of Yemen and stated that it wants for Syria what Saudis have in Saudi Arabia. Just a few years ago, the Saudi regime banned his plane form flying over its airspace due to its commitment to ICC ruling. Yesterday, he was received with open arms and he praised the human rights record in Saudi Arabia. Kid you not. [US Department of] State also cites concern over threats from extremist groups as part of justification for US support of Saudi-led intervention in #Yemen". In fact, the extremist groups that the US government is talking about are sponsored and armed by the same GCC countries that launched the invasion. From Rashid: "“Hussein from Riyadh” supports Saudi efforts in Yemen." "Mr. Ghani’s government hired the Podesta Group for $50,000 a month to lobby on behalf of Afghanistan and help with public relations"
Worse than US bombs are the propaganda schemes of the US. They dropped flyers over Syria with cartoons against ISIS. It is so lame. And why do the men appear with odd expressions? Also, the meat grinder is an American idiomatic expressions. Don't they have local native experts? It is such a failure. PS Also, not showing in this particular version of this cartoon is a sign on top that says: "now serving" in Arabic. Didn't they know that this is ALSO an American expression and does not read in Arabic even if translated? What a mess. The Syrian regime yesterday said that it is following closely developments in Yemen. Why don't you first follow closely developments in Syria. Did you know that the lousy Syrian regime had supported the Saudi military intervention in Bahrain? Did Saudi Arabia intervene in Yemen to foil a Huthi operation against Al-Qa`idah in South Yemen? This is an excellent article by comrade Amer about the Saudi war of aggression on Yemen. He explains the sequence of events. How the ISIS-affiliates and Al-Qa`idah in Yemen were sending car bombs to Shi`ite (or Zaydi) mosques in Yemen. And the leader of the Huthis explained that they would not let Al-Qa`idah grow as was the case in Iraq and that there is a need to root them out. The operation began and it succeeded in taking over areas in the South when the Saudi regime intervened. It is evident now that the Bin Ladenites were following Saudi orders in Yemen. Don't tell anyone, please. This is top secret. This writer unocvered a very discreet Shi`ite dissmulation plot in Yemen: "Today, many Yemeni Twelvers still dissemble about their adherence to that school, following the doctrine of taqiyya, or religiously permissible dissemblance." "Colombian Report on US Military’s Child Rapes Not Newsworthy to US News Outlets"
""Yet here we are, over 72 hours since the Colombian and foreign press first reported on the allegations, and there’s a virtual media blackout in America over the case. Nothing on CNN, nothing on MSNBC, nothing in the New York Times or Miami Herald. Nothing in Huffington Post. Nothing in Fusion or Vice. Why? "“We understand why our Saudi and other Arab partners felt compelled to take action. The prospect of radical groups like Al-Qaeda, as well as Iranian-backed militants, finding safe haven on the border of Saudi Arabia was more than our Arab partners could withstand." Someone need to expose this lie by McCain. In fact, the Huthis are sworn enemies of Al-Qa`idah and Saudi regime intervened in Yemen when the Huthis were in the middle of a campaign to root out Al-Qa`idah in South Yemen. By all accounts, the Saudis have been supporting and funding and arming the Al-Qa`idah and ISIS affiliates in Yemen. That is missing from the US coverage of this silly statement. 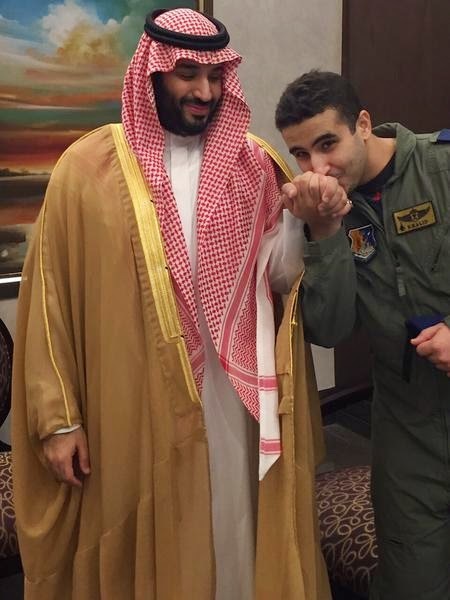 Prince Khalid bin Salman (a pilot, allegedly which in Saudi royal circles means that he is really good at flying games on playstation) kisses the hand of his brother, Prince Muhammad bin Salman. The Saudi didn't know what they have started. The second phase of this war is likely to be a long-range missile war of cities. Saudi air force is known for its accuracy of hits. If it aims at Sanaa, it hits Taez. If it aims at Aden, it hits Riyadh. "That, of course, was not a wholly successful strategy. Over the past decade, there have been at least half a dozen military campaigns with the Houthis, a secessionist movement in the South, the relocation of al-Qaeda in the Arabian Peninsula (AQAP) from Saudi Arabia to Yemen, a popular uprising that lasted 11 months, a fracturing of the armed forces, an externally-brokered transitional agreement, a dramatic escalation in U.S. drone attacks in different parts of the country, and a National Dialogue Conference theoretically designed to put all the pieces back together. So, why think of this as sectarian war? The Houthi’s march on Sanaa in September cannot be easily glossed as “sectarian” just because they are Zaydi Shiites, and most (though not all) Islahis are Sunnis. The existence of nominal difference is not by itself a compelling causal story. The fact that the Houthis are Zaydis does not mean that their movement is aimed exclusively or even primarily at establishing a Zaydi political order, reinstituting the kind of imamate that ruled Northern Yemen for hundreds of years (though some critics will tell you so). Similarly, the fact that Islah’s membership is predominantly Sunni doesn’t mean it is working to reestablish the caliphate, or even that it is willing to cooperate with those transnational movements that would, though its detractors may allege this. Instead, the conflict that pits the Houthis against Islah is one several decades in the making, and rests as much in the structure of the Yemeni North, the hierarchies of power and privilege among Zaydis themselves, and a state apparatus that sought to manipulate them." It his hilarious that the Saudi regime bought off the Sudanese tyrant to ensure Sudanese participation in the Saudi-led war on Yemen. I am sure that his participation reinforced the democratic credentials of this war. Egypt yesterday denied any intention of military participation in a war in Yemen. Today, it participated. Dollars happened between yesterday and today. Whether in Syria or in Yemen, the US is an ally in the same trench with Al-Qa`idah. Will US media now call for racial profiling of German people? Will German-American now be scrutinized as they board planes or try to join flight schools? Will there be calls for the revision of the German school curricula? Will there be calls for the reform German Christianity? Will German churches in the US be called upon to denounce this German crime? Will this German co-pilot be declared a terrorist? It is fair to say that it will be more fun to watch the second generation of House of Saud as they find their way in regional and international politics. 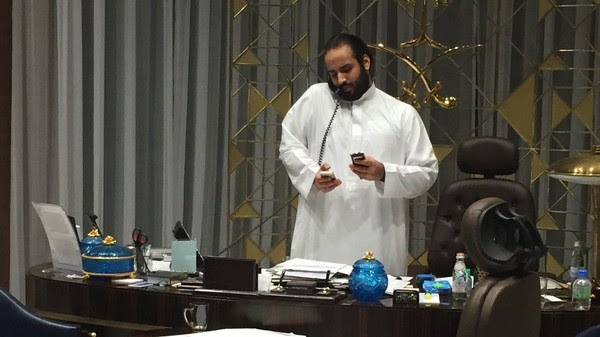 King Faysal believed that the stability of the regime and its preservation requires resort to secrecy and caution in pursuing Saudi regime interests around the world. That is why the royal family perfected the art of dissimulation especially in Arab-Israeli issues (it supported Sadat behind the scene while funding the anti-Sadat coalition at some points). This war is also an American war: it is a gift from the US to the GCC countries who didn't like US policies in Egypt, Syria, and Yemen. The Saudi regime is now pursuing the Israeli option: that it will now be more clearly aligned with the Israeli interests in the region and that it will also be aggressive and violent in pursuing regime interests. Qatar and UAE were the first to openly and officially participate in an open war in Libya, and Saudi royal family didn't enjoy watching the Qatari prime minister lead the Arab League from 2010 to 2012. The Saudi regime took matters in its own hands and decided to pursue an alternative policies in Egypt. On every issue in Arab politics, the Saudi regime is aligned with Israel. Make no mistake about it: Israel is the secret member of the GCC coalition bombing Yemen. In the 1960s, the Saudi regime ignited the war of Yemen to thwart a progressive and republican alternative to the reactionary immate regime (and Israel supplied weapons to the Saudi side in that war). In this war, the GCC countries are supporting a corrupt and reactionary puppet regime created by Saudi Arabia and the US. Saudi Arabia never allowed Yemen to enjoy independence. It saw in itself the legitimate heir to the British imperial power in peninsula. The Huthis (with whom I share absolutely nothing) are a bunch of reactionaries but who were created due to the very policies and war pursued by the Saudi regime in Yemen and their then puppet, `Ali `Abdullah Salih. South Yemen had the only Marxist state in the Arab wold and the experiment was sabotaged by the reactionary House of Saud. There is an entertainment value to this war as the Saudi regime actively and openly launches war on another Arab country. Who does not want to see, yet again, the Huthis humiliating the Saudi army on the battle field (look up the last battle with the Huthis on Youtube when Saudi soldiers ran for their lives). 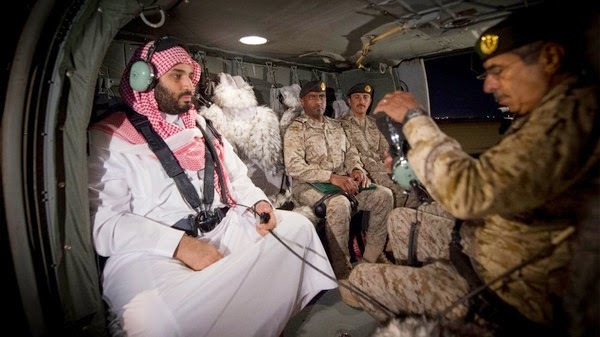 And who does not want to see a Saudi royal brat leading his army to yet another humiliation on the battle field. In all the Yemeni war, the Saudi regime always sponsored the option that guaranteed more longevity for war and destruction. This is no exception. I have never thought that the demise of the Saudi regime would be expedited by the 2nd generation of Saudi princes. I never thought that there could be a more corrupt and more incompetent prince than Khalid bin Sultan: but think again. Muhammad bin Sultan (seen above leading the battle from his office) is your man, o US and Israel. Enjoy him. W. M. Watt: US Support for Israel "Root of this Trouble"
"I therefore certainly don’t think the West is locked into Jihad with Islam, though I suppose if the fundamentalists go too far they’ll have to be opposed. Iran’s comments about the “Great Satan” were aimed mostly at the United States: they were not made because the West was Christian. I think the West should try to overcome these strains between different religious groups. I do, however, think that the US is following a very dangerous policy in relation to the Middle East. The root of this trouble is that the US gives too much support to Israel. They allow them to have nuclear weapons and to do all sorts of things, some of which are contrary even to Jewish law. Jewish families occupy Arab houses without payment. That is stealing. I think that the US should be much firmer with Israel and put a lot of pressure on them, though this is difficult because of the strong Jewish lobby. Unless something is done there’ll be dangerous conflict in the Middle East. Such danger would be less likely to arise if all three Abrahamic faiths - Jews, Christians and Muslims - paid greater respect to what God teaches us about living together." The man the US supported for president in Afghanistan has graciously asked the US to keep troops in Afghanistan forever. I never thought that a puppet of occupation can be more loyal to the occupation than Hamid Karzai until I heard of this man, Ghani. "Did you hear about the man who entered New Orleans’ airport with explosives and a machete? No? Well, you would have if he’d been Muslim. Well, last Friday night, this exact event took place at the New Orleans airport—that is, except for one factual difference: The attacker was not Muslim. Consequently, you might be reading about this brazen assault for the first time here, although this incident did receive a smattering of media coverage over the weekend." From Alfred: "I do know a person who calls himself a Palestinian whose grandfather came from Mardin, Turkey in 1915 when Syriac Christians were being slaughtered in Turkey. During WWI thousands of Armenians and Assyrians fled from Turkey to Syria, Lebanon, Iraq, Egypt, and the smallest number came to Palestine because you have the smallest number of Armenians and Assyrian Christians in Palestine . Also, I do know of a person from the Saade family from Amioun, Lebanon who went to live in Palestine in the early 20th century who stayed in Palestine and married a local. But, we do not hear of the many thousands of Palestinians who emigrated to countries like Chile and El Salvador, which today number over 900,000 people during the same period. I know of many Syrians and Lebanese in Lebanon, Syria, and around the world who came from Palestine "a few decades earlier" and if you would look at the immigration numbers you would find out that many more times more Palestinians traveled to lands outside Palestine than "those Arabs who had traveled to those lands only a few decades earlier"." Even the Zionist Brookings is admitting the obvious: that Al-Qai`dah is a major force in the Syrian "insurgency"
"In fact, while rarely acknowledged explicitly in public, the vast majority of the Syrian insurgency has coordinated closely with Al-Qaeda since mid-2012"
"Syrian armed opposition groups, among them jihadists but also Western-backed rebels, have indiscriminately targeted civilians in violation of the laws of war, Human Rights Watch said on Monday." "The report said several dozen car bomb attacks in Damascus and Homs provinces had hit areas with no government military targets, and often targeted districts occupied by religious minorities." "Among the worst of the bombings was an attack in October last year outside a school in the Akrameh neighbourhood of central Homs city that killed more than 45 children." "Nevertheless, the soldiers of Charlie Company raped women, burned houses, and turned their M-16s on the unarmed civilians of My Lai." "The truth remains elusive, but one G.I. described to me a moment that most of his fellow-soldiers, I later learned, remembered vividly. At Calley’s order, Meadlo and others had fired round after round into the ditch and tossed in a few grenades. Then came a high-pitched whining, which grew louder as a two- or three-year-old boy, covered with mud and blood, crawled his way among the bodies and scrambled toward the rice paddy. His mother had likely protected him with her body. Calley saw what was happening and, according to the witnesses, ran after the child, dragged him back to the ditch, threw him in, and shot him." "As I pointed out in a post last year about Saudi Arabia’s growing influence in American politics, the Saudi government also funds the Bill, Hillary & Chelsea Clinton Foundation, the Middle East Policy Council, the Middle East Institute and the Smithsonian Freer Museum of Art." From "moderate" to "mainstream": what is the difference, alas? It is very much like W.M. Watt in his (last?) book, Islamic Fundamentalism and Modernity. He let it all out and expressed real hostility to Muslim discarding the earlier niceties of his career. Hoffman, who used to think of as the least insane and least ignorant among the terrorism experts, has just published a new book "Anonymous Soldiers" about terrorism and the origins of the Arab-Israeli conflict. I am reading the book and he is quite unabashed in his endorsement of Zionist terrorism. "Israel protests Hungary's Eurovision entry"
From Balázs in Hungry: "Now this is really the non plus ultra! “One of the captions in the song's video refers to Operation Protective Edge, stating: '2014 – Gaza – two-thirds of the victims were civilians, including more than 500 children.’ "
Now if this “senior (most idiotic) official” is right, this will be shame on us Hungarians." "Isareli settlers are colonising Palestinian territory under the guise of moving in to areas to protect historic archaeological sites, the British government has said." "Elad has previously paid the Israel Antiquities Authority to dig deep trenches near the foundations Palestinian homes and mosques in East Jerusalem. Palestinian residents of the area blamed the excavations for the collapse of a number of their buildings, according to Israeli newspaper Haaretz." Apartheid regime cannot be called "democratic"
"But among Israelis themselves, there is increasing angst over the fact that their country of 8 million people also controls some 2.5 million West Bank Palestinians who have no voting rights for its parliament. If the 2 million Palestinians of Gaza — a territory dominated indirectly by Israel — were added to the equation, then together with the 2 million Arab citizens of "Israel proper" the Holy Land would be home to a population of some 12 million, equally divided between Arabs and Jews. Of the Arabs, only a third have voting rights." "The unexploded bomb, 10ft long, weighing more than a ton, and delivered by an Israeli warplane, had been the talk of Gaza’s Beit Hanoun neighbourhood. The family was one of 40 households in Gaza sharing their residence with explosive devices because they had nowhere else to live." From Roger: "Does anyone know the answer to this question? Has any member of US Congress spoken against the racist rhetoric of Netanyahu? I could not find any example." If the media barely touched that speech that spouted trash and racism against Persian ("you can't trust a Persian at a bazar table" he said), how can you any expect congressmen/women to speak against it?" Just wonder if a Muslim cleric spike for females, would that be considered out of modesty?" 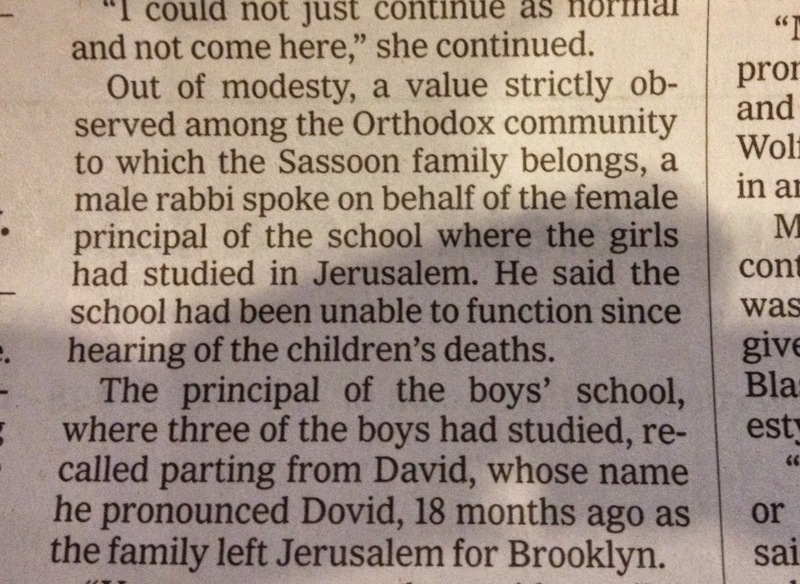 "Out of modesty, a value strictly observed among the Orthodox community to which the Sassoon family belongs, a male rabbi spoke on behalf of the female principal of the school". Can you imagine an American paper writing: out of modesty, Saudi government does not allow women to drive? "Khamenei speaks often about the destruction of Israel. But he rejects doing so by means of a war. “We recommend neither a classical war by the army of Muslim countries nor to throw migrated Jews at sea.” (It’s good to know that he is against drowning Jews en masse!) Akbar Ganji, Iran’s best-known dissident, who was jailed for criticizing Khamenei, argues that the supreme leader has been consistent in this position for years — no war, certainly not by Iran. What does Khamenei advocate? A “public and organized referendum” in which Muslims, Christians and Jews living in the area under Israeli jurisdiction would decide on the fate of their government and regime. " "The fact of the espionage, an American official said on Tuesday, was less upsetting than how it was used." So if Israel commits a massacre, the New York Times would publish a story about how "Israel denies committing a massacre". And similarly, if Israel spies on the US, the New York Times publishes this story: "Israel Denies Spying on Iran Nuclear Talks"
Can someone explain French secularism to me? How does it work? Does it only work firmly against Islam and Muslims? "La France a accordé 1 500 visas d'asile à des chrétiens d'Orient depuis l'été 2014"
The mother/father of all cyber-terrorists is holding a conference. J Street basically believes that Israeli racism should be less blatant. J Street basically believes that the murder of Palestinian children should proceed at a slower pace. Has any member of US Congress spoken against the racist rhetoric of Netanyahu? I could not find any example. "For plaintiffs and some critics of the government's response, the suit and its labyrinthine path are a reminder that few have faced significant consequences for the documented abuse that Americans carried out after the overthrow of Saddam Hussein." Let me explain the US government positions on pictures: the US government is fully in support releasing the gruesome pictures of the Caesar's collection that allegedly show the images of victims of the Syrian regime but is categorically and firmly opposed to releasing pictures of Abu Ghraib. As for the US media? Pretty much in support of the US position. Can you imagine the uproar if someone were to vomit such hate against Judaism and world Jews? Would that person be accorded respectability by the media? "Gebhardt believes that members of the US military raped as many as 190,000 German women by the time West Germany regained sovereignty in 1955, with most of the assaults taking place in the months immediately following the US invasion of Nazi Germany." "The document suggests CSE has access to a series of sophisticated malware tools developed by the NSA as part of a program known as QUANTUM. As The Intercept has previously reported, the QUANTUM malware can be used for a range of purposes – such as to infect a computer and copy data stored on its hard drive, to block targets from accessing certain websites, or to disrupt their file downloads. Some of the QUANTUM techniques rely on redirecting a targeted person’s internet browser to a malicious version of a popular website, such as Facebook, that then covertly infects their computer with the malware." The fake sentimental humanitarianism that many Western correspondents feign about the Syrian people is quite distasteful, if you ask me. I am looking for the expression of humanitarianism that does not serve US imperial agenda. I also like how when it comes to the suffering of the Palestinian people, Western correspondents hide behind the alibi of the need to be objective in reporting, while that alibi is not needed about Syria. Spare me. This is nothing short of a piece of propaganda that you read in the Saudi-funded Arabic press. This is what is hilarious: when the Saudi regime beheads and cuts off limbs, Islamic law is blamed. But when the regime commutes sentences, the Saudi regime is credited. Yes, not all sentences are carried out because there are IN ISLAMIC LAW flexibilities and "tricks" that allow for the judge to exercise leniency, and also because financial compensation have been an accepted remedy in ancient Arabic culture. Big deal. That doesn't make the Saudi injsustice system less unjust. "Doug Ollivant, who worked in the National Security Council for Mr. Obama and President George W. Bush, said Mr. Ghani is a “Western-oriented” leader who would be comfortable rubbing shoulders with intellectuals at the World Economic Forum in Davos, Switzerland, or the Aspen Ideas Forum in Colorado. “He’s a creature of Washington, a creature of Aspen and Davos,” he said. “He’s extremely comfortable moving in these circles.”"
"But then why do Arabs, who may have traveled to those lands only a few decades earlier, have the right? " Who are those Arabs who had traveled to those lands only a few decades earlier? And is this influence of Peters on Zakaria akin to the plagiarizer leading the plagiarizer? "So where do all these drones come from? Mostly Israel The middle eastern country is the largest exporter of drones. 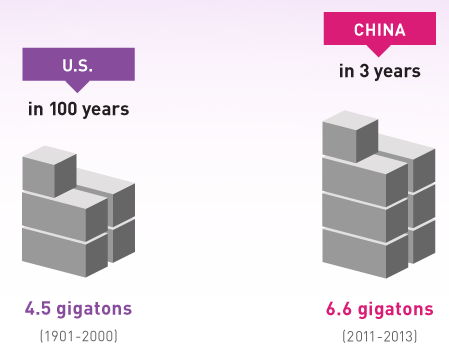 Between 2010 and 2014, it delivered 165 units across the globe. 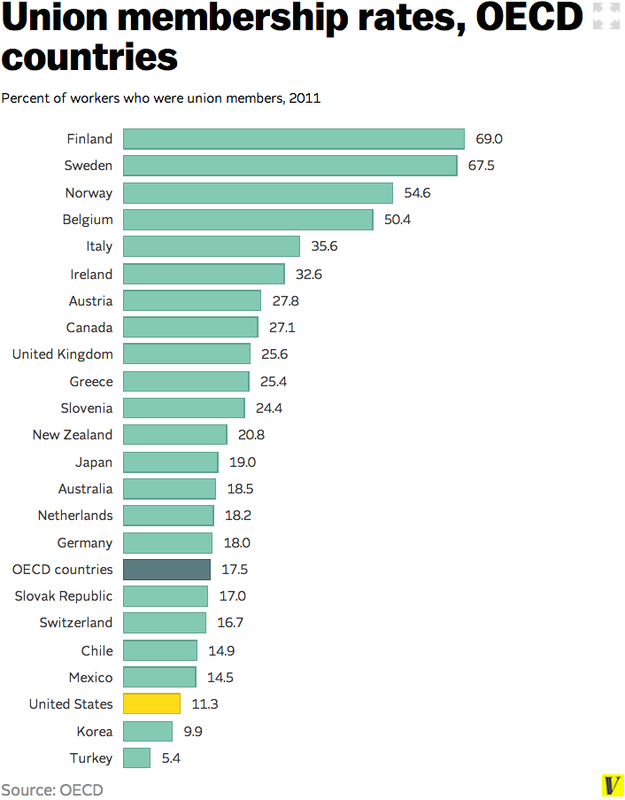 The US came second with 132, followed by Italy’s 37. Since 1985, Israel has accounted for the majority (60.7%) of drone exports worldwide." "The Boycott Divestment Sanctions (BDS) movement in South Africa particularly rankles Israel and its intelligence service. Historically, Israel understands the international role a similar movement played in the toppling of the Apartheid government. This troubling precedent makes Israel especially vigilant to counter what it perceives as the growing momentum inside SA against Occupation and Israeli Apartheid." "Israel fears that if left unchecked, pro-Palestine activism will develop unstoppable momentum, leading SA to sever diplomatic relations with Israel. This could be the beginning of the precisely the sort of domino effect that eventually brought down the Apartheid-era government." WHO says U.S.-based Monsanto herbicide can cause cancer, U.S. government says it's safe! It is just amazing how much Zionist US media love to promote anyone who harbors hatred for Islam and Muslims, qua Muslims. If this woman says about Jews what she says about Muslims, she would be shunned and people would picket all her speaking engagements. But she speaks against Islam (as a religion) and against Muslims, and that does not in any way cause people to condemn her bigotry. She is not a specialist or an expert or an academic or a journalist or a scholar or a professor and yet, she is--only because of her bigotry--treated as an expert on Islam. Just as, in reverse, people who are fanatic in their defense of Israel are treated as experts on the Arab-Israeli conflict. On the Middle East in the US media, love (for Israel) or hate (of Islam and Muslims) are considered qualifications. The New York Times is a right-wing mainstream Zionist publication, but its Book section is even worse than the paper. Is its editor not writing a hagiography of William F. Buckley? Writer in the mouthpiece of Prince Khalid bin Sultan, Al-Hayat, Dawud Al-Shiryan, maintains that Swedish criticisms of Saudi human rights violations are Orientalist. I kid you not. "On the Haganah’s broader influence, Mr Hoffman notes that al-Qaeda’s Afghan library had a copy of Begin’s “The Revolt”". Iraqi writers and journalists refute in numbers the article by Anne Barnard about Iraqi casualties and question whether she had actually visited the Najaf cemetery. "Russian police are hunting an unusual vandal, who sprayed graffiti on a site in Kaliningrad where philosopher Immanuel Kant is thought to have lived. The 18th-Century philosopher, whose work on ethics and metaphysics, heavily influenced Western thought, spent his life in what was then Koenigsberg. Now the phrase "Kant's a sucker" has been sprayed on a ruined house in green paint, along with a heart and flower. It is not the first time that Kant's philosophy has provoked hostility. " Let me assure you. A statue of Kant would be safe forever here in the US. No one would know who he is. Yesterday, I was thinking and reading about that period, I am now of the view that Nasser should have intervened militarily back in 1961 to prevent and foil the secessionist coup of 1961, which was linked to the Jordanian and Saudi (and possibly American) governments. 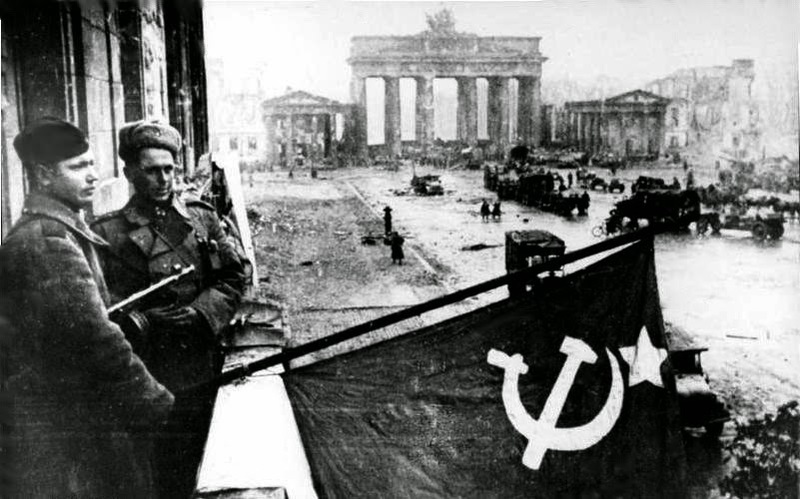 And before your fake democratic sensibilities get offended, which union or federation was not imposed by force? His non-intervention was yet another example of the naivite of the Nasserist regime and his attempt to win favor with the American administration. He repeated that mistake later in 1967, when he did not strike first at the Israeli occupation entity. When US ambassador (during the Kennedy administration), John Badeau first sat with Nasser, he wanted to impress him with his Arabic. He started to converse with him in Arabic (which he had studied at Columbia), but Nasser could not understand a word and asked him to switch to English. A horrible conception of Islam that would kill 130 Yemeni Shia praying in their mosque. trib.al/sbPn13q pic.twitter.com/vsF8dmOGbK" Would he ever describe US wars as "horrible conception of democracy"? Would he ever describe Israeli wars and bombings as "horrible conception of Judaism"? And this is a liberal human rights leader. From Basim: "“No one is leaving alive. There will be no deals. Our people have made the decision to wipe them out completely,” says a veteran Hezbollah fighter who has served multiple tours in Syria. “Whoever holds Tallet Mousa holds all the wilderness of Arsal,” the Hezbollah veteran said. “We will help the Army if they need it but where we will be going, we go alone,” the Hezbollah fighter said. While confident of a Hezbollah victory, he acknowledged that the militants are “tough fighters.” “They are very well trained,” the fighter said. " "It is clear that both he and Netanyahu prefer a Republican audience. Dermer was the keynote speaker of the Christians United For Israel meeting at the Washington Convention Center last July. Netanyahu sent in a grateful video message. CUFI, as the organization is known, was founded by John Hagee, a Texas megachurch pastor who has preached against Catholicism, Islam and homosexuality and has written books including “Four Blood Moons: Something Is About to Change,” which argues that four big, red moons in 2014 and 2015 will harken a major shift for Israel." ‏@sheeraf Erekat, getting skepticism from reporters on whether now they finally were ending security coop says, "it's really happening this time."" "our empire was built by the sword and erected over the dead bodies of tens if not hundreds of thousands of our Indian subjects"